Drawbar force is the measure of force being applied to a toolholder to keep it in contact with the spindle. The drawbar is a mechanical device used to apply clamping force to the toolholder. The drawbar is located out of sight and not easily accessed, often left unmonitored. The drawbar works by using Belleville Spring stack, gas systems, or other methods to generate the drawbar force. As the Belleville Springs begin to collapse and gas systems begin to leak, the drawbar loses force. If drawbar force becomes too low, a cutter can be pulled out of the spindle; damaging the tool, the spindle, and the work piece. This results in issues with chatter, repeatability, short tool life, and poor finishes. Have you ever wondered why you can't run the same job on different machines, or tool life is better on one machine than another? It could be your drawbar. Our hydraulic ClampForce Gage is the easiest product to use for checking drawbar force. It is the first universal gage on the market that is able to check all types of V-flange, Capto, HSK, and KM spindles. In seconds, it indicates in ft/lbs the amount of force being applied to the toolholder. Once drawbar force drops below 80% of the original manufacturer's setting, it is time to schedule maintenance. ClampForce Gage hydraulic heads are available in 3,000, 5,000, 10,000, and 15,000 lbf configurations. It is the perfect solution for the smaller shop that is looking for a quick and inexpensive method to check drawbar force. The hydraulic gage head comes with a toolbox and protective packaging for easy storage. One gage head will work in many applications. 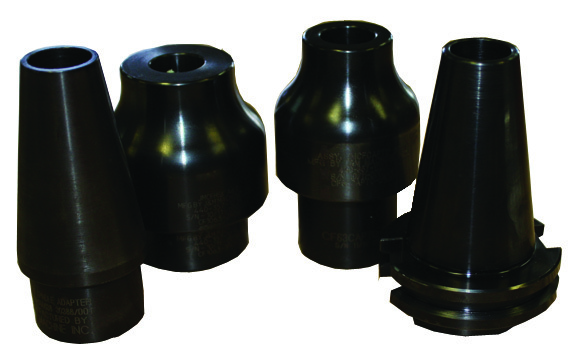 ClampForce Spindle Adapters are available in CAT, BT, HSK, Capto, KM Tooling, and for ATC (Automatic Tool Changers) and are available in many sizes.